Navy blue American Apparel crop top, Gold spike necklace c/o Jeweliq, Navy Zara skirt (similar cute leopard style) and plaid shirt (similar style), Brown leopard clutch c/o DAAME, Brown fox wrap bracelet c/o Jeweliq, Black studded heels c/o Choies (white and red versions). A trend I can definitely say I have grown fond of and that has shown up multiple times this past NYFW are crop tops. 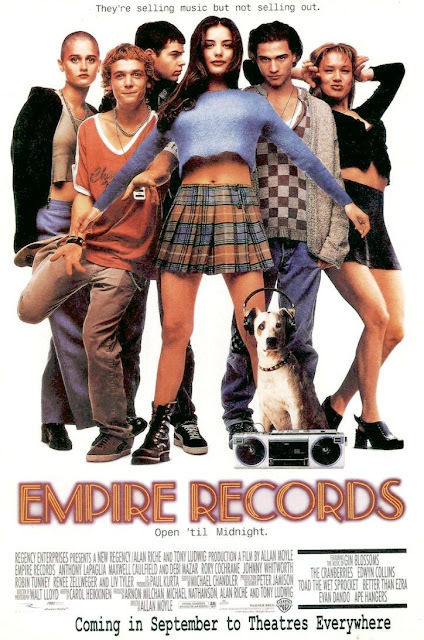 I think we could thank the gorgeous Liv Tyler from Empire Records (a fave movie too!) for setting the foundation of this great trend. In addition, bringing back the 90's, loving the plaid and shirts tied around the waist this season. This print is definitely one of my favorites for Fall. I love mixing prints, so decided here to pair plaid with a hint of leopard. And to add to the grungy feel, I accessorized with a spike necklace and these gorgeous studded heels from Choies. Thanks so much again lovelies for the sweetest birthday wishes everywhere (twitter, facebook, instagram), had such a great day bc of you guys! This weekend am going to celebrate with close friends over sushi and the club in the city, can't wait for a fun night. Hope you lovelies have a great weekend ahead..yep already in that weekend mode ;). i love the 90's.....great outfit....so Saint Laurent! you are so hot here! love the outfit. TONS! seriously. You're looking even more beautiful, Kathleen! Oh my! Been a follower of your blog and I am really loving your style evolution. Great look! Really love the animal print paired with the blue plaid. 90's chic! Loving this super spunky twist on your style!